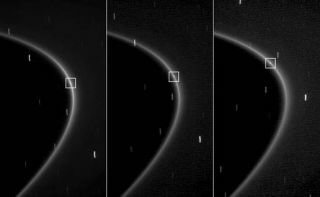 This sequence of three images, obtained by NASA's Cassini spacecraft over the course of about 10 minutes, shows the path of a newly found moonlet in a bright arc of Saturn's faint G ring. A faintpinprick of moving light spotted by NASA?s Cassini spacecraft in Saturn?s Gring appears to be a moonlet that could be the main source of the ring,astronomers announced today. Cassiniscientists analyzing images acquired over the course of about 600 days foundthe tiny moonlet, which measures about a third of a mile (half a kilometer)across, embedded within a partial ring, or ringarc, previously found by Cassini in Saturn's tenuous G ring. Before thediscovery, announced today in an International Astronomical Union circular,astronomers a single particular moon that could explain the formation of the Gring. "BeforeCassini,the G ring was the only dusty ring that was not clearly associated with a knownmoon, which made it odd," said Matthew Hedman, a Cassini imaging teamassociate at Cornell University in Ithaca, N.Y. "The discovery of thismoonlet, together with other Cassini data, should help us make sense of this previously mysterious ring." Saturn'srings were named in the order they were discovered. Working outward they are:D, C, B, A, F, G and E. The G ring is one of the outerdiffuse rings. Within the faint G ring there is a relatively bright andnarrow, 150-mile- (250-kilometer-) wide arc of ring material, which extends90,000 miles (150,000 kilometers), or one-sixth of the way around the ring'scircumference. The moonlet moves within this ring arc. This bringsthe number of Saturnian ring arcs with embedded moonlets found by Cassini tothree. PreviousCassini plasma and dust measurements indicated that this partial ring may beproduced from relatively large, icy particles embedded within the arc, such asthis moonlet. Scientistsimaged the moonlet on Aug. 15, 2008, and then they confirmed its presence byfinding it in two earlier images. They have since seen the moonlet on multipleoccasions, most recently on Feb. 20, 2009. The moonletis too small to be resolved by Cassini's cameras, so its size cannot bemeasured directly. However, Cassini scientists estimated the moonlet's size bycomparing its brightness to another small Saturnian moon, Pallene. Hedman andhis collaborators also have found that the moonlet's orbit is being disturbedby the larger, nearby moon Mimas, which is responsible for keeping the ring arctogether. The newmoonlet may not be alone in the G ring arc, as previous Cassini measurementsindicated manyother bodies ranging in size from a few to several hundred feet could belurking there. "Meteoroidimpacts into, and collisions among, these bodies and the moonlet could liberatedust to form the arc," Hedman said. Early nextyear, Cassini's camera will take a closer look at the arc and the moonlet.